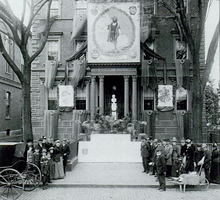 ^ a b Charles Speroni, "The Development of the Columbus Day Pageant of San Francisco," Western Folklore, Vol. 7, No. 4 (Oct. 1948), pp. 325–335.U.S. State Department, Bureau of International Information Programs. ^ “LBJ Signs Bill to Set Up Five 3-Day Holidays”. Sarasota Herald-Tribune. Associated Press (via Google News). (1968年6月29日). https://news.google.com/newspapers?id=9eYhAAAAIBAJ&sjid=5GUEAAAAIBAJ&pg=6061,7091289&dq=district+of+columbia&hl=en The bill in question became the Uniform Monday Holiday Act. ^ "Idea of Discoverers' Day insults native Americans", Mary Adamski, Honolulu Star-Bulletin, October 13, 1998. ^ South Dakota Codified Laws. 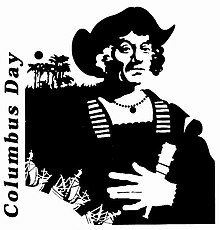 Nevada proclamation: Nevada Revised Statues Chapter 236, section 236.025 "Columbus Day"
^ a b c Prakke, L.; C. A. J. M. Kortmann; J. C. E. van den Brandhof (2004). Constitutional Law of 15 EU Member States. Kluwer. p. 748. ISBN 90-13-01255-8. https://books.google.com/?id=oGj0PS8C5akC&pg=PA748&dq=%22Fiesta+Nacional%22%2Bespana&q=%22Fiesta%20Nacional%22%2Bespana 2009年9月30日閲覧。. ^ a b c d Molina A. de Cienfuegos, Ignacio; Martínez Bárcena, Jorge; Fuller, Linda K. (Ed.) (2004). “Spain: National Days throughout the History and the Geography of Spain”. National Days/National Ways: Historical, Political, and Religious Celebrations around the World: 253. ISBN 978-0-275-97270-7. https://books.google.com/?id=llmCOvtWcUcC&pg=PA334&dq=%22National+Day%22+spain&q=%22National%20Days%20throughout%20the%20History%20and%20the%20Geography%20of%20Spain%22 2009年9月30日閲覧。.